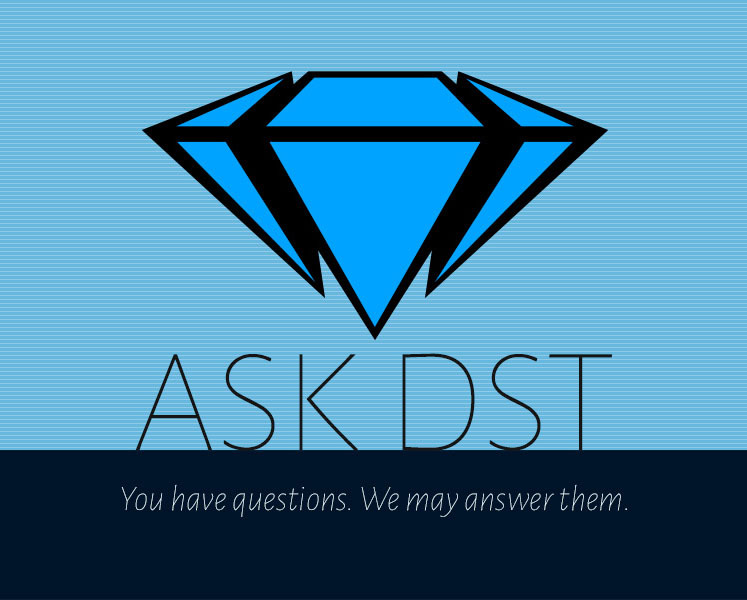 It’s a cornucopia of questions this week in Ask DST! We opened the flood gates and sent Diamond Select Toys president DSTChuck everything we had, and he answered them all! Read on for info about busts, banks, action figures, Vinimates and electronic vehicles from Pacific Rim: Uprising, Star Trek, Batman (1966 and animated), Dark Tower, the Muppets, Real Ghostbusters, Pulp Fiction, X-Files, Universal Monsters and more! It’s the best of all worlds! Check for your question below, then submit it in the drop-down form up top or e-mail DSTChuck! 1) Will you be making Select actions figures (7 + inch articulated figures)? 2) And if so, how will you go about scale? Will you make the robots the same size as your average 7″ human figures, or even larger, much like your amazing Hulkbuster figure was? 3) Is there any chance for Kaiju, or will you be strictly doing robots? 4) Are you only able to make Pacific Rim 2 figures, or are characters from the first movie a possibility too? Thank you for your time, I really appreciate it. I think there is a lot of potential here, and I’m looking forward to seeing what you guys can do! 1) Yes, the Pacific Rim toys will be Select-sized. 2) The Pacific Rim toys will be pretty large, and there will be some relative scale between each Jaeger. 3) Yes, we are developing some Kaiju. 4) Toys from the first movie would be possible. We’re VERY excited to be working on this great property. I own all of the iZombie products you guys released so far. Any plans for more figures or Minimates? 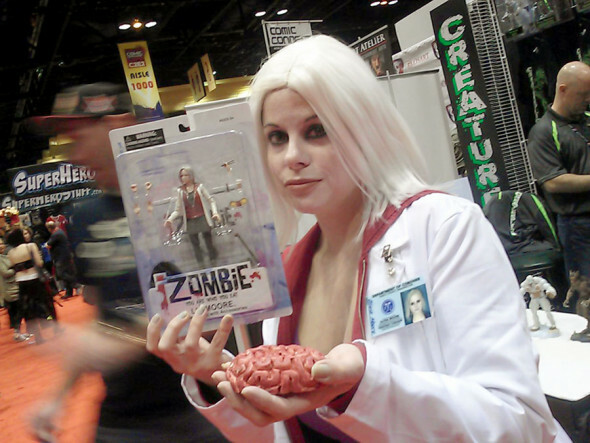 DSTChuck: Right now there are no plans for more iZombie toys, BUT it’s something we constantly discuss. I was not a real ardent fan of Voyager but, after seeing the rerun twice, the one ship that SCREAMS for a replica from the Star Trek universe is the U. S. S. Prometheus! The ship splits into 3 separate combat vessels when needed, I would LOVE to see one made with the separation feature. DSTChuck: I am sorry, but the Prometheus is not on our short list of ships we are looking at. Hi DST. Any idea when the Star Trek Select Borg figure and USS Reliant will be released? What types of Star Trek products will you concentrate on going forward as it seems McFarlane Toys will also be producing some Star Trek items? Thanks for your time. DSTChuck: We are doing final changes and factory prep with the Borg and Reliant, and should have concrete news on both very soon. We have no changes to our plans as a result of the McFarlane deal. 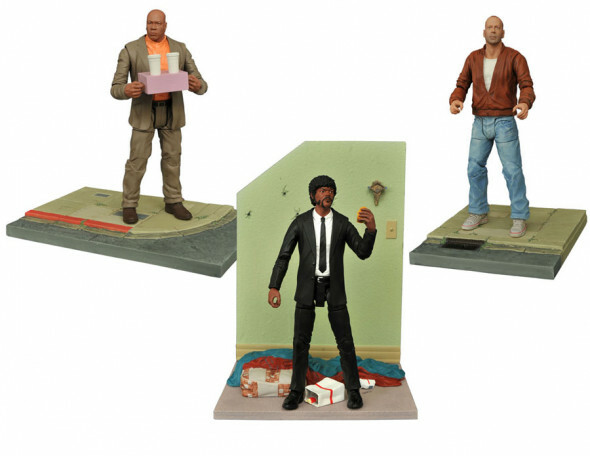 Hi, I would like to know if there are plans for more 7″ figures from “Pulp Fiction” (with likeness rights)? And if yes, I hope you could name them. DSTChuck: Yes, we have a couple more series planned, but I don’t think we’re ready to put all the details out there. I collect your products and I think you guys do an amazing job, especially with the likeness of the faces– really, really good! Saying this, I was wondering if you guys are going to ever make Back to the Future toys like the size of the Marvel Select ones…. or maybe a size that would fit in the Delorean that you guys already made which is amazing! Thanks, I’m a big fan! DSTChuck: Randy, glad you dig what we are doing, but I am sorry to say we are not allowed to do likeness action figures from BttF. Is the USS Reliant still in production since it was not displayed at SDCC? DSTChuck: We have not shown the Reliant at a consumer show because the sculpt is not 100% factory-ready and still needs some final approvals. Will Diamond Select be re-releasing “THE REAL GHOSTBUSTERS” toy line again? Retro toy figures? DSTChuck: We have never done any RGB toys to re-release, and we will not be re-releasing products made by other companies, BUT we do have RGB action figures planned shortly down the road. Besides Robby the Robot, the Iron Giant and B9… What other Vinimate robots, cyborgs, androids, etc., can we maybe see, sooner or later? 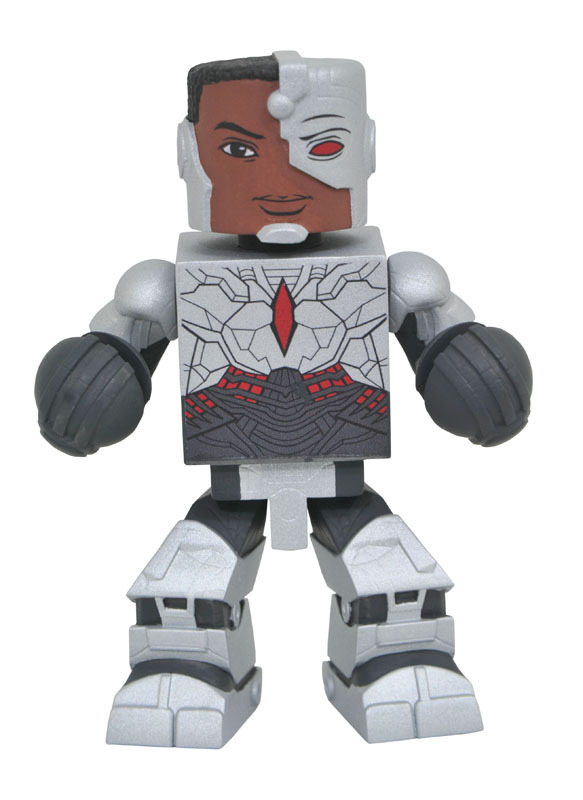 DSTChuck: Cyborg from the Justice League movie would be next, this fall. There are no others in the works at this moment, but there have been some ideas tossed around, including Pacific Rim: Uprising. I’m really hoping that after the Reliant is released you guys do an Oberth Class U.S.S. Grissom. That would fully flesh out your TOS movie era set of ships! DSTChuck: I do not think that will be the ship after the Reliant, but we’re not 100% set on the ship that will follow the Reliant. Is there any chance of seeing a light and sound Battlestar Galactica (prefer classic) similar to your excellent Star Trek ships? DSTChuck: Right now, we have no plans to do more products for BSG, but it’s something that we do discuss from time to time. Really love the electronic Star Trek Ships. Please tell me the Voyager and Defiant (DS9 version) are in the works? Would also love to see the Next Gen D’deridex Romulan ship, Ferngi D’Kora Marauder, and the Cardassian Galor Cruiser. Keep up the great work. Live long and prosper. DSTChuck: Defiant is one of my favorite ships, and we have received several requests for Voyager, so we’ll see what the future holds. I just found out about the Star Wars Ultimate Quarter Scale figures! Very interested in them. Why were they canceled? Any chance they will be started up again? DSTChuck: Sorry but there are no plans at this time to revive the UQS Star Wars line. 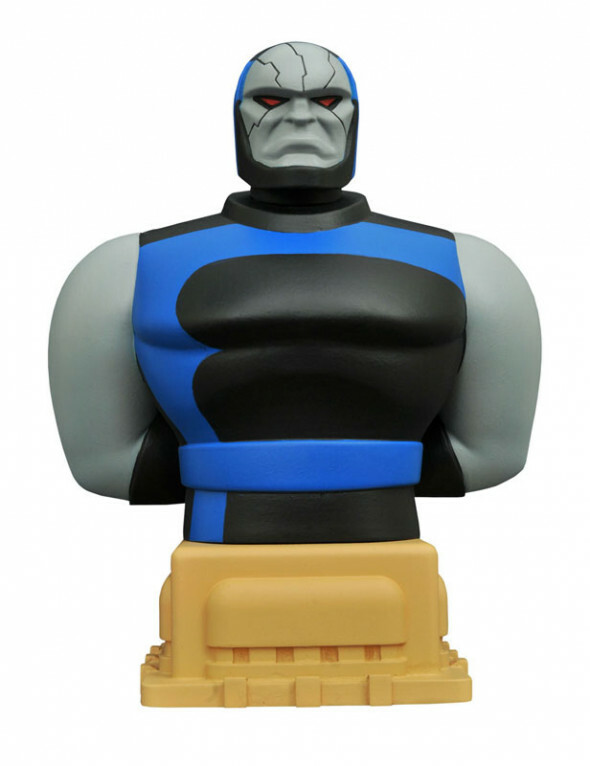 Hi, I have a question about the Batman and Justice League animated busts. At this year’s SDCC you only showed busts that were available for preorder. In the past, you would have shown busts that were not at the preorder stage. Will you still be adding more busts to the collection? Thanks. DSTChuck: We have more planned for the animated lines – we did not show any simply due to timing in the development cycle. When will news on the next Star Trek Select figure be coming our way? DSTChuck: Borg is next, which should be VERY soon, and after that we have something cool planned for the next couple figures in the line. 1) If the Muppet Select line continues past Series 4, do you see it continuing to prioritize new characters, or do you think we’d start to see costumed variants of existing characters creeping into the line? 2) If you could sneak one more Muppet figure into the current line, without having to consider cost, practicality, or common sense, who would you choose? DSTChuck: I think, right now, our focus is on getting series 4 out to fans and making sure retailers know how much demand there is out there from fans. If it ever were to go past S4, I think there is a chance some variants could happen, BUT we have only had preliminary talks about anything past S4. 2) I’ve always like Sweetums, but I think that’s from the old Muppets 4D show at Disney. I would like to get an Enterprise ship bank from the originals Star trek series. DSTChuck: That is something we have talked about, but not sure what demand would be with the electronic ships already so collected. 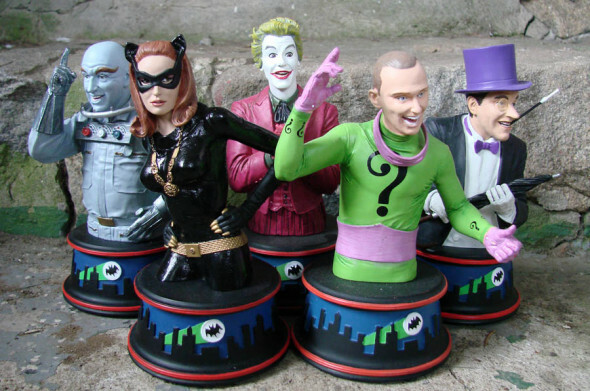 Can you share what the next Batman TV 1966 Resin Bust’s will be? Any plans on doing False Face or The Puzzler or Clock King? DSTChuck: We do have some more 1966 bust in the works, BUT they are not villains. all of other characters from this film? I’d love the little bald cat eyed Jackie Earle Haley ‘right hand man’ villain or even an army builder of those Orc like minions troops that worked for The Man in Black or even a Jake. Probably zero chance of that happening eh? Did you guys plan on & or sculpt any beyond the 2 or…? Anyways thanks for the figures & I can’t wait to get them. That last action scene in the movie was so awesome. Thanks! DSTChuck: I have to be honest, I’ve read a good number of the books but not all (and I liked them), and I’ve seen the movie, and as a totally separate thing I liked it, too. The figures are moving along very well, and September is still our target month. The two figures we have done would have to do well and find a further audience to do new figures. Hi DST. Thanks for giving me the opportunity to ask these questions. 1. 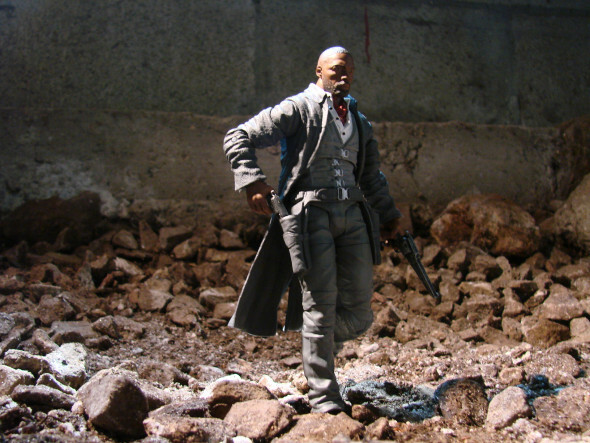 It’s so rare to get any Stephen King merchandise so I was more than excited to see that this company is making action figures from The Dark Tower. Any possibility of Pennywise or other King characters in an action figure form? 2. Big fan of the Star Trek figure line. Any plans for villains like Gary Mitchell from Where No Man Has Gone Before? 3. Any chance of a Marvel Select Old Man Logan or a Logan 2017 film action figure in the future? 4. I personally would kill for action figures of the villains from the X Files “Home” episode or any X Files villains for that matter. Super excited to see what you do with Pacific Rim 2 and the Cthulhu figure. Thanks so much! 1) It’s been GREAT to have the chance to work on something from Steven King, however it only includes the new movie. 2) Sorry, no plans at this time for a Gary Mitchell figure. 3) Sorry, at this time we have no plans to make figures based on any of the Fox movies, but an Old Man Logan is possible in the future. Our Marvel Gallery PVC Diorama of him recently did fairly well. 4) I think we’d very much like to do more X-Files figures, but I don’t know how far we will be able to go with the line – sales will dictate. I absolutely love your Muppets action figures – fantastic job! Before Palisades went under they were planning on Sesame Street action figures – what is the possibility that Diamond Select will make these? No one, and I mean NO ONE makes Sesame Street action figures – you would certainly have the market for these in your pocket. Here’s to hoping……..cheers! DSTChuck: I am sorry, but we have no plans to make any figures from Sesame Street. Hello. Are you ever going to release a Bela Lugosi as Dracula Bust Bank in your Universal Monsters Line? A lot of fans like myself want to own one very much. Please consider making one. It will be a good seller. Completionists want him alongside the other Monsters. Thank you. DSTChuck: Right now, we are not producing products for the Universal Monsters movies, BUT the talks with Universal Studios are ongoing. Question not answered? Check previous Ask DSTs, then submit it in the drop-down form up top or e-mail DSTChuck! 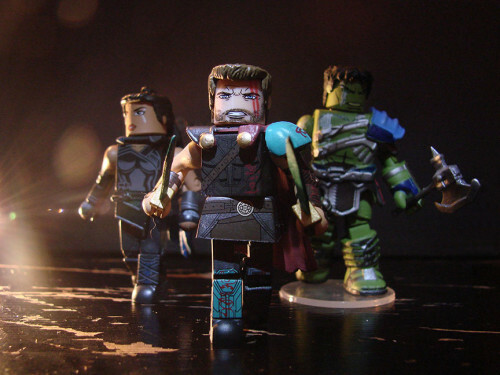 Next Up: Ragnarok Arrives Early With New Marvel Minimates in Stores Now!